It can be argued the vast majority of BBQ grills are portable if you have power lifter biceps. I don’t. So what I mean by best portable BBQ grill is one the average person can easily carry along with the other provisions they’ll be bringing to their outdoor shindig. Therefore, a small BBQ that is lightweight and will not be damaged by the knocks and bumps expected in transport. We have also covered the subject of portable stoves which you might be interested in, as these give you so many different cooking options. But if like me you love the smells, theater and primal passions that BBQ food brings out in people then the only way to achieve this at events such as picnics, camping and festivals is to buy yourself a portable BBQ. So what is the best portable BBQ grill? This depends on several factors that are personal to you, such as your budget, how big a cooking area do you need, do you prefer charcoal or gas, etc. I have run through the questions you need to ask yourself at the bottom of this article. But first, let’s look at all the best portable grills in each class. Charcoal grilled food is by far my favorite type of grilling, it gives the taste of meat that something a little bit extra. And it’s clearly not just me that feels this way because portable charcoal grills have become the most competitive niche of all the portable grill types – with all the major brands vying for your money. Let’s start with the king of the barbecue world – Weber! You can pretty much guarantee any grill you buy bearing the Weber name will be of the highest quality. And when it comes to portable grills, Weber hasn’t let us down. They have two of the best portable charcoal grills, and the name of the first one tells you all you need to know about its portability. The Go-Anywhere charcoal grill has been specifically designed for easy transportation and set-up. The second great portable charcoal grill from Weber is an offshoot of one of the greatest grills to have graced our yards. The Smokey Joe is basically a fun sized Weber kettle grill. There is actually three different versions of this amazing grill. Firstly you have the Smokey Joe Gold portable charcoal grill. For me this is the best of the three options. The Smoke Joe Gold has a lid lock that doubles as a lid holder, making it easier/safer to carry and gives you somewhere safe to put the lid when checking on your food. The next two options from this range are also great portable grills but I’d buy the one above unless you fall into one of the following two categories. 1, You are on a really tight budget. If this is the case then look into the Smokey Joe Silver, it’s exactly the same as the gold version except you don’t have the lid lock feature (but with the difference in price only being around the ten dollar mark, if you can afford it, get the gold grill). 2, you need a slightly bigger grill size than the average portable grill. If this is the case then you have the Jumbo Joe, which is 18-inches compared to the 14-inches of the Smokey Joe Gold. 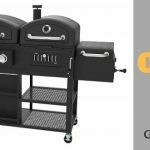 At the price and quality of the above two portable charcoal grills you really can’t go wrong, in fact for most of you there is little point reading the rest of this article. Just go and buy a Go-Anywhere or Smokey Joe grill. Now for the few of you that haven’t left to buy one of the previously mentioned grills I’ll assume it’s because there are some caveats that need to be met. Like you need a super compact grill or folding BBQ or one that uses a different fuel type. So instead of running through a list of grills that are just a poor imitation of the Weber grills, the rest of the grills discussed will give you something a bit different to the two best portable grills I’ve just given you. If compact folding BBQ grills are what you are after there are a good number to choose from. I find it hard to pick a winner between the Elemart portable grill and the Fire Sense Notebook grill. Both are designed to be folded into such a small space that they can easily be slipped in a backpack, they’re also light and have a good sized grilling space. So in order for you to choose, I’d simply go with the one you think looks best. Note that these BBQs don’t have lids and are meant for hot and fast cooking only. Another great grill that differs significantly from the Weber grills is the Son of Hibachi portable grill, made by Mr. Flame. This BBQ has a few great features. One is you can buy it with a rotisserie, which lets you spit roast up to three whole chickens in one go. It’s also been designed to get your coals fired up and ready to cook in under 10 minutes. How? well it’s because the grill is actually two grills folded together. 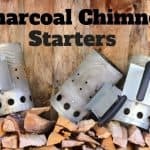 When you add coals and return it to it’s closed/folded state, you can light the bottom and have the grill act as a chimney starter – one of the best and fastest ways to start a BBQ. Not content with just these great features, Son of Hibachi also has what they call a Snuff out Pouch. This is a patented fire retardant lined bag that lets you fold up the grill while the coals are still hot and carry it away. Once the BBQ is zipped up in this bag it stops oxygen from getting to the coals and does what the name says, snuffs them out. Watch the below video, it’s a bit long-winded and is meant more for BBQ distributors but it does have some great tips. It’s commonly excepted to call these BBQs portable gas grills but the reality is they are portable propane grills. If you’re using natural gas that would mean you’re hooked up to your cities main gas supplier, disqualifying the grill from the description of portable. So when the term gas is used with portable, we are talking about liquid propane. Top of the list for portable gas grills is where we invite Weber back to the party, and it’s with the good old Go-Anywhere BBQ. Weber decided the Go-Anywhere was so good they’d make a gas version. It might look the same as the charcoal version, but of course being gas it differs in functionality. It has a push button ignition switch and a protruding pipe for you to connect liquid propane cans. You’ll see some people give bad reviews on this portable gas grill, but the surprising reason is that it’s a gas grill and not charcoal. Not sure what they were thinking when they bought it, as they could have just purchased the charcoal version. Continuing the Weber love fest we now offer up another Weber portable gas grill, and yes this is another great BBQ but this time the major selling point is the university logos that adorn these grills. If you’re proud of your university and want to show that off then this BBQ is the one for you. Not only does it have the university logo on the lid but it’s also in their colors. 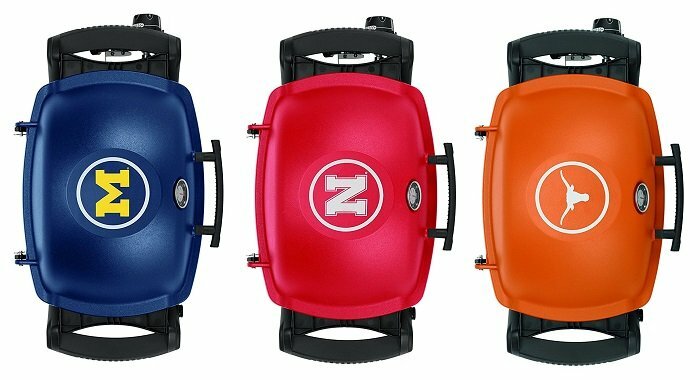 But the Weber Q1200 series isn’t in the best portable grill list for nice colors and a logo, it’s because it is a top quality gas grill. 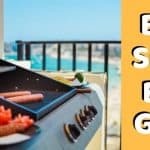 Let’s wrap up the best portable gas grill section with a list of my top 5 gas BBQs. 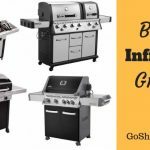 This is because there isn’t much more to say on gas grills, all five in the list are very similar regarding quality and how they work. The main deciding factor will be how they look, and that’s a personal choice for you to make. I’m going to fudge the original definition of portable grills for this section on portable smokers; these aren’t the sort of BBQs that you can walk for hours carrying. You could bring these to a picnic area if it’s not far from the car park, and equally for camping or festivals. But I’d say the primary goal of these portable smokers is that they’re taken tailgating. I have three recommendations for a quality portable smoker, and I’ll give you these in order of weight, as the lighter the smoker the easier it is to transport. So we’ll start with a grill from the people at Green Mountain This portable smoker weighs in at 57 pounds (26kg) and goes by the name Davy Crockett Pellet Grill. 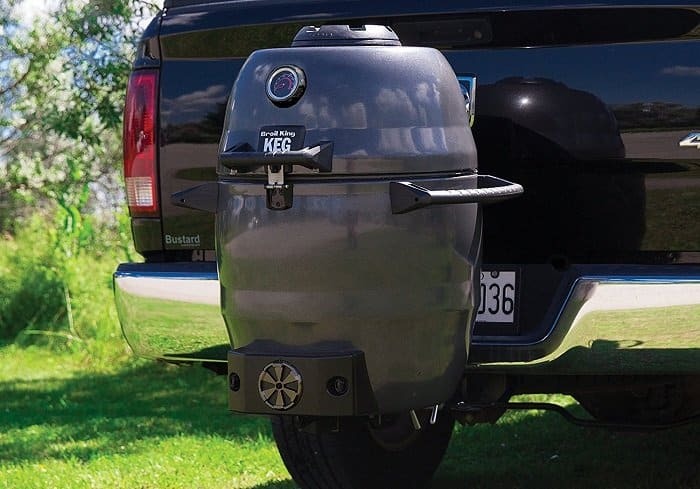 The company advertises this portable smoker as ideal for “camping, tailgating, hunting, house-boating and music festivals,” and it comes with a great feature for a BBQ – a Wi-Fi controller. Meaning you can monitor and control temperatures from your phone. My favorite smoker is a Kamado Joe, and the good folks that make this smoker also make a portable smoker called a Joe Jr. They describe it as “Perfect for tailgates, picnics, pool parties, camping and more” and weighs 68 pounds (31kg). The average person should be ok moving this kind of weight around for short distances, but any more than that I’d suggest you go for one of the other grills I’ve already mentioned. And last but not least we have the Broil King Keg Kamado smoker. Weighing 126 pounds (57kg), I’d say this is way too heavy to be called a portable smoker. But it does come with its own cart to be wheeled around easily, and it has been designed for tailgating in mind; having a hitch adapter. Also unlike most Kamado grills, Broil King have not made theirs from ceramics, they made it from steel in order to better withstand the rigors of regular transport. So for all intents and purposes, the Broil King Keg is a portable smoker but you need to either use the accompanying equipment or get yourself down the gym. Portable wood grill – Cook-Air is the front runner in this field with the EP-3620BK Wood Fired Portable Grill. Cook-Air is extremely fast to set up, taking approximately 5 minutes to bring up to a good cooking temperature. One of the beautiful parts of cooking with wood is the added flavor you can add to your meat. This is Cook-Air’s best selling point, because at the end of the day, it’s all about the food. Portable Electric BBQ – I’m sure many of you will say if you need a power point for a BBQ it’s not really portable. And I’d agree up to a point. You couldn’t take it to picnic, out camping in the wilderness or most festivals, as you’ll have no power outlets. But if you’re well prepared you can bring a portable power pack or car adapter with you, and of course, as these grills are very light you can easily carry them to a place that has mains power. So although it’s nowhere near as portable as other BBQs mentioned, there are still times an electric grill can be deemed portable. And Weber has just the grill for you, the Q 2400 Electric Grill. I promise this article isn’t paid for by Weber, it’s just they have a lot of quality BBQs for all manner of situations and budgets. Disposable BBQ Grills – Don’t do it, for the love of god, don’t do it!! Even if you only intend to BBQ just once your entire life I’d still not recommend a disposable grill; all you’ll do is ruin your food. I’m sure there is no need for me to follow up on this, the fact you’ve searched out portable grills leads me to believe you are beyond disposable BBQs. Portable Infrared BBQ – Char-Broil offer up a unique twist to the gas grill with their Char-Broil TRU-Infrared Portable Grill2Go. It’s a gas powered grill that uses TRU-Infrared technology. Why would you choose a portable inferred grill? Well, Char-Broil claim cooking in this manner helps retain up to 50% more moisture in your meat when compared to traditional grilling methods. It’s also a safer method to cook as you’ll get no flare-ups while cooking. Instead of having me explain the benefits of infrared cooking watch the video below. You’ve now picked your favorite portable grill, and this will provide the heat source to cook your food. Heat is all you need to cook, humans have been cooking on open fires for years after all. But we are a species of tool builders, and the years we’ve spent cooking outside has led us to develop some pretty simple tools to make grilling a whole lot easier. So bring this equipment with you in the form of a portable BBQ tool set. The main pieces of equipment you should be looking for in a good portable grilling tool set is a pair of tongs, a sharp knife and a spatula. These three bits will have you covered for most of what you’ll cook on a BBQ but most tool sets come with much more. Normally you’ll find kebab skewers, a grill cleaning brush, a marinade brush, a piercing fork and corn cubs. I like this 10-peice grill set from Grill Heat Aid, it has what you need without going overboard, and the carry case is made in a way you can add extra tools if needed (you’ll find many portable tool sets come in plastic molded cases that only allow the equipment they provide). Grilling Surface Area – If you want a portable grill to bring with you on a romantic picnic then the size of the cooking area will be of little importance, all BBQs will have adequate space. But as the number of people that need cooking for increases the size of the grill becomes a lot more important. So before buying consider the intended use of the BBQ, as a few extra inches of grilling space can make all the difference. Heat Output – One of the main benefits of BBQ cooking is the high temperatures you can create, helping sear meat and getting the maillard reaction every good grill cook desires. So ask how hot the grill can get before buying, this will often be given to you in British Thermal Units (BTU). The Higher the BTU the better. Temperature Control – Having a grill that can get extremely hot is one thing, but having control over the temperature is another. A top quality portable grill will give you both because grilled vegetables need a different heat than grilling meat. So look for a grill that has a lid and air vents, these two options will give you all the control you need. Build Quality – As you’re probably well aware, you generally get what you pay for. Sometimes you pay more for the privilege of having a brand name plastered all over a product, but most of the time an expensive item will be better than the cheap one. And one of the major downsides to buying online is you don’t get to inspect a product before buying. You have to rely on other people’s reviews or take the price as a guide to quality. Ignition Switch – Hopefully the name speaks for itself. A switch that is used to ignite the grill. Of course this is a feature to look out for on a gas grill, not a charcoal grill. Transportation Features – Portability is what you want in a portable grill so having extra features to aid in the transportation is definitely something to look out for. This can come in the form of a wheeled cart or a carrier case. Charcoal Storage – One of the main problems for a portable charcoal grill is the charcoal. I’d normally use my BBQ to store the charcoal while carrying it, but with a foldable grill this isn’t always possible. So think ahead before you buy, will you be ok with this extra weight with how you intend to use the grill? Assembly – This will be no issue for many of the grills recommended in this article. But you might not be buying one I’ve recommended, and if this is the case have a look at how to assemble it. The last thing you want is to get to your desired location only to find you needed to bring a screwdriver or spanner. Stand – Look for a portable grill that has a wheeled cart that doubles as a table stand unless you are happy to cook sitting down. I didn’t realize that there was so much to take into consideration when choosing a portable grill. Although, the one that attaches to the back of the truck like that looks really cool. If it is powered by the car itself then that could actually be a pretty useful grill.